When it comes to Customer Relationship Management (CRM) software, it is common knowledge that Microsoft Dynamics CRM is one of the leading products on the market. There are a multitude of reasons for this, from the benefits it offers to the rich functionality it provides as well as the backing of a worldwide technology vendor. 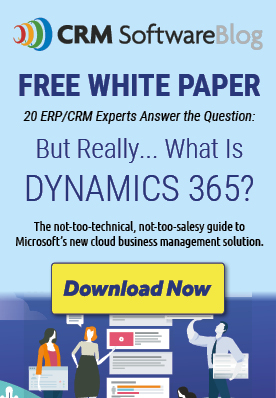 But many people have asked for an easier way to understand what makes Microsoft Dynamics CRM such an impactful solution. That is now available…and we have the pictures to prove it. The CRM Software Blog, of which BroadPoint is a participating member, recently developed an infographic titled, “12 Great Reasons Companies Use Microsoft Dynamics CRM to Drive Revenue and Serve Customers’. The infographic provides simple, easy-to-follow images that describe why Dynamics CRM is such a great CRM offering. Many people have raved about how effective the infographic is at taking the vast benefits and functionality of Microsoft Dynamics CRM and distilling it into a few images. To learn more about Microsoft Dynamics CRM and how it can benefit your company, contact BroadPoint Technologies, the largest Microsoft Dynamics re-seller in the mid-Atlantic, at [email protected] or 301-634-2404 .